In Oregon, a ghost forest emerged from the sand that had been missing for 300 years. A magical place and a forest emerged from the sand after over 300 years. It happens in Oregon, to be precise in Neskowin, a small coastal town located between Lincoln City and Pacific City, here are the remains of Sitka trees that belonged to an ancient forest. Sitka is a tree native to the United States and well known all over the world. It grows mainly on the west coast and is considered one of the largest conifers in the world, along with Douglas sequoia and fir. The plant reaches up to 50 meters in height, but some specimens are able to exceed even 70 and even 90 meters. Until some time ago the ghost forest was hidden in the sand, but between 1997 and 1998 a particularly violent storm hit the Oregon coast. The winds and the rain have eroded most of the beach, bringing to light over a hundred tree trunks that had disappeared 300 years earlier. For years, the forest had represented one of the best known legends in this corner of the United States. Cyclically, in fact, the trees had appeared, showing themselves to visitors, then disappearing shortly thereafter. Since 1998, however, the Neskowin wood has come back to life in all its beauty and is clearly visible on the beach. But what is the history of these trees? Analyzing the logs would have emerged that they are over 2 thousand years old. The researchers found that between 1600 and 1700 a quake would hit the west coast of the United States, causing a tsunami that would have covered the forest with sand. The forest, dubbed Ghost Forest, has made this area of ​​America famous, attracting many tourists, impressed by the show. 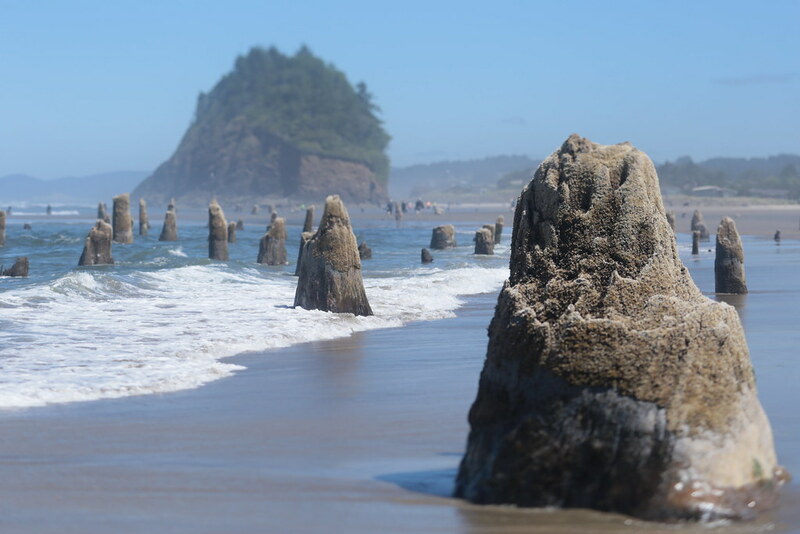 When the tide is low, tree trunks emerge from the water and, like hundreds of totems, appear before visitors' eyes, leaving them open-mouthed.